Conservatives Tell me what is wrong with this…Please? On Twitter, I have asked Conservatives to tell me what is wrong with this Danish school teacher comment, and why is war good? 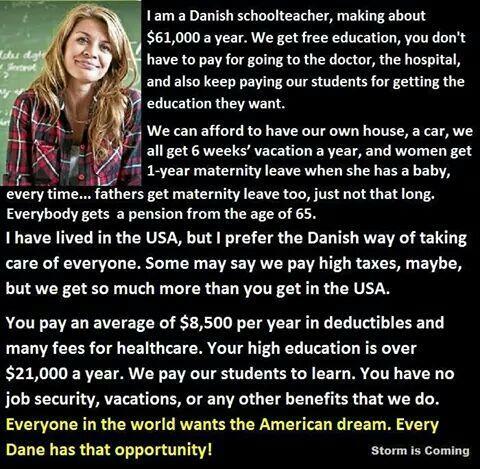 So far the only answer I received is Denmark is not like this, because he knew someone from Denmark? 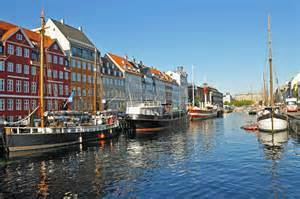 Then I ask… If Denmark was like this what is wrong with it and why is war good? In the US we have a few good social programs all in jeopardy from conservatives, who want privatize them. What they really want is to profiteer. They have already privatized prisons, been working on schools, and Congress is looking at privitizing the Post Office, Social Security, Medicare and anything else which both would provide profit for a few and if at the same time destroy unions Post Office and Schools, two large unions, for years now the fight against Teachers Union has been ongoing and relentless. Teddy Roosevelt and FDR had the same fight against wealth Robber Barron types …so rehashed, relentless greed is back. The inequality gap has widened enough to make some people of wealth feel entitled, enabled and as Aristocrats. We live in a society not in a vacuum, well unless one is living in Texas. This entry was posted on March 30, 2015 by leefeller in Politics and tagged Aristocracy, Conservitisim, Denmark, privitize, socialism, unions, US Post Office.